Wadi Karkur Talh and it's secrets - new cave paintings discovered. 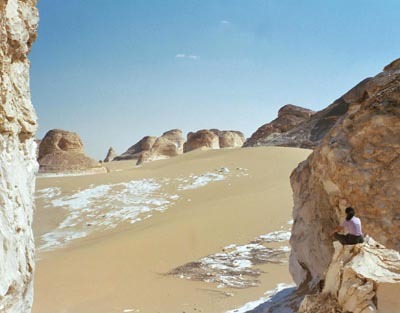 A desert expedition to the remotest part of the Libyan desert set out from Cairo in November 2002 to research archaeological sites in the Gilf Kebir and Uweinat mountain districts. Our leader was András Zboray and the team included 2 Hungarian, 2 German and 3 English, drawn together by a common love of desert travel. András Zboray, Hungarian, who has earned himself a well-deserved reputation for his knowledge of the Western Sahara, his navigational, administrative and archaeological skills. Magdi Zboray, András's wife, mother of two, consultant in Budapest, where she is specialises in Financial and Pharmaceutical audits. Bernhard Loersh, a dentist from Munich, much travelled, desert wise, photographer, with many challenging trips to his credit. Andreas Kuehnl, a dentist too, friend of Bernhard, strong hiker, skilled climber, reliable and attentive co-traveller. Hannah McKeand, PR Director for a UK Theatre, talented and potent climber. Singer without equal, well developed desert skills and an invaluable member of our team. Raymond Bird, a retired engineering consultant with unstoppable energy, worldwide travel experience and a great researcher and navigator. Myself, photographer, traveller, writer, ex-Saudi expatriate, married to sculptor Lyn Constable Maxwell, two grown sons, with many solo desert trips experience. Khalid, our Egyptian interpreter, Salama and Saïd, our Bedouin drivers, and Col Asraf, our military observer who authorised our trip to (and across) the border territory. We left Cairo at dawn and drove all day. We were packed into two Toyotas; all rations, water and stores were packed into one car, and the 8 passengers shared limited leg-space in the other. Both roof racks were piled high with extra water, fuel, food boxes, firewood and we were heavily laden for our 3-week expedition. 14 hours later we pulled up at Dakhla, a small date-growing oasis where we spent the night. Hannah, Raymond and I filled 50 extra jerry cans of fuel, 200 gallons, which we loaded onto the racks. András supervised an oil-change for each car, Magdi bought oranges and curly cucumbers, Khalid bought water, Salama gathered firewood, uncut branches which were lashed onto the top, and the rest busied themselves about the many tasks that engage travellers setting off for 3 unsupported weeks in the one of the most remote and inaccessible parts of the planet. We were travelling into uncharted territory in Egypt's Western Desert. This is border country and we were obliged to take a military officer with us. Our party numbered seven; all of us had desert experience, but most of us had not met each other before the trip. We also had Khalid, our Egyptian interpreter, and two Bedouin drivers, Salama and Saïd, and Col Ashraf, our military observer. We left Dakhla at dawn and arrived for a late lunch at the White Desert, Farafra, a large area of weirdly eroded rocks with a grand natural arch, curves, cliffs, overhangs, rock islands all dotted around the undulating sand dunes. I took several photographs and soon Magdi appeared in them too... It was very hot and we reminded ourselves to carry our water bottle with us every time we left the car from now onwards. We continued driving many miles, interspersed by several military check points, before arriving at a predetermined GPS fix where András announced we would leave the road. We reduced tyre pressures and headed off across the sand, led by no landmark, no goal and no target, save for our GPS fix, pointing generally South West. The sandy landscape unrolled before us and soon all trace of civilisation was gone - and would remain absent for the next 3 weeks. At dusk we stopped in the sand sea, surrounded by many sweeping dunes. We sprang out of the car, free at last from those cramped confines and climbed the dunes. Andy set out for a distant dune and returned an hour later with a rare migrating duck, long dead, which he presented to me for my dinner. Raymond set about his desert pitch and soon had his tented world organised. Bernie strode off across the dunes and wasn't to be seen for hours, and Hannah mounted the first dune crest and burst into song with sheer delight. The night was cold, and in the morning the warm rays of the sun spread out around the dunes. The ever changing light engaged the senses and set us further and further away from the material world we had just left behind. We drove off through the dunes and into softening sand, and then into varied rocky terrain. By 11.00 we hit the Selima Sand Sheet, a huge tract of flat, featureless desert stretching from horizon to horizon - we drove for hours, craving something to look at, something to mark our progress, but nothing appeared. We drove on, obeying our navigation instruments and plotting progress on our maps. Late in the afternoon we came to our first landmark, the feature known as 'Eight Bells'. These conical mountains mark the southern end of the Gilf Kebir and was a welcome sight after our 1400km drive - soon we would arrive at our days' destination. A short while later we arrived at the Mt Uweinat massif. We reached the splendid entrance to Karkur Tahl, a great sweeping valley meandering off into the distance, waterless but supporting a sprinkling of Acacia trees. The valley is bound on each side by low cliffs, rocks and crevasses and fed at intervals by side wadis and canyons. 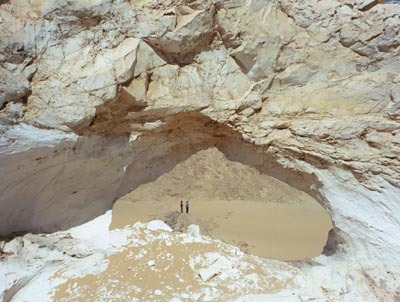 Blown sand blocks the entrance to the valley and comprises a formidable obstacle to vehicles. We lowered the tyres pressures again and scrambled across, the heavy vehicles expertly driven by Salama and Said, until we reached the firmer ground of the main valley. Coming back up wasn't to be so easy, but we comforted ourselves we would be carrying less weight by then. We drove off down the valley and came to an old marker post in the sand - Sudan! Our military commander was invited to look the other way, and we carried on, ignoring such trivialities as international borders in this wild and desolate place. We passed tracks of gazelle and fox, and trails of snakes and scorpions. The intermittent Acacia trees spread their branches in welcome shade. We are now some miles inside Sudan and we come to a charming wadi some 100 metres wide and 400 metres long. The valley was bound by steep sides which would give shade during the day and wind protection at night. This we chose as our base camp for the next few days, pulled up and unloaded the two cars. We all searched around for friendly camping space among the sand and boulders. András and Magdi chose a soft sandy base below the cliff, Hannah chose a small ledge, Raymond chose a rocky shelf, I selected a sandy site shaded by a boulder. We pitch our little tents and soon we are all unpacked. Now it is time for the evening 'Sundowner' cocktail. We assemble in the sand, pass around the bottle and then András cooks us a splendid meal. We dined by moonlight around the fire, swapping happy travellers tales. The next day, our first day without travelling, we set off on foot down the wadi to search for new sites - and I found one! This is better than fishing, I thought… András found another, and by mid morning we had all found at least one, most never recorded before. No water has flowed here since the last ice age; we were exploring territory unquantified by nomads, untenanted by camels, unseen by humans for 5,000 years. We walked up a long way up a side wadi and examined every cave, rock and overhang searching for rock-art and new photographic vistas to capture the magic of this lost land. András has X-ray eyes and could find sites hidden to the rest of us. On a typical mountain walk, Hannah would scamper lightly up one side of the canyon, while Andy would power his way up the other. At the top they would meet Bernhard, who had the skill of getting everywhere first, and András who would be just leaving when they arrived! The canyon walls were modelled by time, sculpted by wind, scarred by erosion and animated by the ever changing light. We climbed them, lived with them, loved them, befriended them. Every turn was a new experience, every vista a view into history. On one long bend in the canyon the walls were layered by ice-age cascades aeons ago. Hannah climbed up onto a high ledge, 100 feet above us, and burst unexpectedly into a faultless rendering of 'O Mia Bambino Caro'. Far down in the rocky auditorium we stood spellbound as the melody reverberated off the valley walls. Her singing spoke volumes for her highly trained voice, her notes resonated with a rare talent and flowered with a saturating passion.… and history was made in that wild place. The sounds lingered on for precious seconds before stillness reclaimed the silence of eternity. This was a truly magical moment that will remain with us all. Hannah took her brief bow as we applauded, and then disappeared over the skyline to explore new horizons. I walked up a long picturesque watercourse, dry for 5,000 years, and took many photographs. The desert has a way of re-orientating us with eternity, and this experience came to me now, alone in this unexplored and unvisited place. On the way I came to a narrowing ravine which eventually proved impassable; 'Kit's Waterfall' - I backtracked, climbed up the cliff and came out on top where I wrote a message in the sand for the others, to tell them where I was heading. The waterfall was important, not so much for this event but for our discovery of, we believe, the first and only 'roundhead' painting in the Uweinat area. 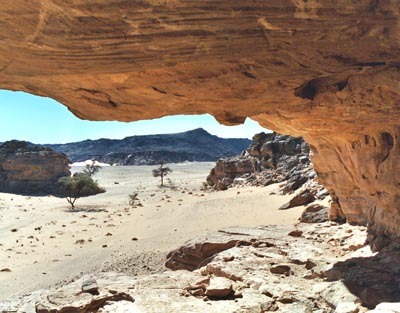 Roundheads are well known in the Tassili n' Ajjer, Algeria, some 1800km West from here, but were believed to be absent from this part. There will be much discussion in intellectual circles when this news is published by András. Today we set out at 06.00 for an all-day walk to an adjacent valley, home to the only water source in Sudanese Uweinat. Well laden and backpacked with water, dried fruit and cameras, we walked up and up a wadi strewn with huge boulders. We crossed some spectacular scenery revealing ever changing views of the Uweinat peak that we were to climb later. We stopped for breaks, took a snack and moved on. Several new rock art sites revealed themselves to our searching eyes; and each would be recorded with meticulous care by András with camera and GPS fix. We crossed the watershed at around midday and started the slow descent into Karkur Murr. The valley open up before us, steeper than the last but wilder and more picturesque. We stopped for lunch on a high shady ledge with a commanding view of the valley floor below. After a short siesta in the shade we set out to look for the one tiny crevasse in this great waterless waste, and came at last to a small palm tree. This was the first living thing we had seen all day and promised well. A little further we spied, in the distance a tiny glint of water below a great boulder - Ain el Brins. This was an extraordinary find in the driest part of the desert, where no rain has fallen for 8 years or more. We splashed about in the naturally hewn trough, drank, and washed. Andy filled his shirt with water and took a desert shower under it. Around were several green plants, a small palm tree and some acacias. Well pleased with our find we climbed the sheer wall of the valley and headed off North across the plateau. I climbed up the cliff with the unstoppable Raymond who had walked the whole way with us. At 79 he was the star of the day and one of the most agile too. If the climb was arduous, the plateau was very uncomfortable, with scattered rocks bruising the feet even through our thick soles. It was a long walk, over 12 miles that day, and we arrived back at Karkur Tahl tired, late but happy. Back at camp András announced 'bar open' and we enjoyed a memorable Marguerita cocktail with lime and orangeade. We sat in the warm sand and discussed the day's events, savoured our drinks and nurtured our blisters. András cooked a fine turkey and noodle dinner and we retired to bed under a panoply of stars.